Plum pudding is a Christmas dessert staple on many tables, especially those whose roots are in the British Isles. The classic plum pudding recipe calls for the pudding (or cake) to be steamed. It is served with a sauce flavored and scented with sherry or brandy. Generously grease the bottom and side of a 4 cup mold with shortening. Pour the milk over the bread crumbs in a large bowl. Mix in the shortening and molasses. Stir in the remaining ingredients except for the sauce ingredients. Pour the mixture into the mold and cover with aluminum foil. Place the mold on a rack in a Dutch oven. Pour in boiling water up to the level of the rack. Cover and heat to boiling over low heat about 3 hours or until a toothpick inserted in the center comes out clean. 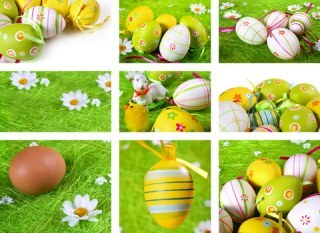 If it is necessary to add water during steaming, uncover and quickly add boiling water. For the sauce, beat the margarine in a small bowl with an electric mixer on high speed for 5 minutes or until fluffy and light in color. Gradually beat in the powdered sugar until smooth. Stir in the sherry, Cover and refrigerate 1 hour or until chilled. Unmold the pudding, cut into slices and serve warm with the sauce. You can also use a 4 cup heat proof bowl. For a dramatic presentation, serve this pudding flaming. Place sugar cubes soaked in lemon extract around the pudding. Light one and watch the flames circle the pudding. 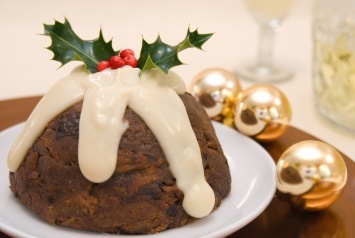 This Christmas pudding is a version of Christmas fruit cake. The steaming softens the cake and makes it beautifully warm. Served with the sweet sherry or brandy laced sauce, it is the perfect ending to a Christmas dinner. The traditional plum pudding recipe calls for suet, or beef fat. This recipe substitutes vegetable shortening. The purists may disagree, but I think this recipe is quite delicious. You can even serve this recipe flaming (see the tips section below). Served on a beautiful plate, flaming at the Christmas dinner table, this recipe makes a wonderful end to your Christmas dinner. Plum pudding makes a great Christmas dessert recipe. We also have Christmas fruit cake recipes. Look here. When I was a little girl growing up every Christmas my grandma would make her best ever cake, but this is no ordinary cake. Grandma would prepare her dry ingredients and her wet ones to add together. When she was done she would stuff her mix into a fabric something like a soft canvas. She would boil this onto a big huge pot for about four hours. When her cake was done, we eat this tasty cake after our christmas meal and it was so delicious. I am sorry I cannot share how she prepared and what she put into her mix, all i remember it was a traditional cake in a fabric and boiled with love. This is an old cree traditional cake.